Successfully Added Headrest/Stand In-Car TFT LCD Monitor, 9 inch (Black) to your Shopping Cart. Quick to set up and easy to use, this 9 Inch Headrest/Stand In-Car TFT LCD Monitor has plenty of uses and will make your drive as smooth as possible. Along with being able to display vibrant and high resolution movies and show GPS navigation on a larger screen 9 inch screen, you also get the ability to attach a rearview car mirror so you can see everything behind you and reverse park safely and easily. Connect a DVD Player, MP4 Player, Media Player: For the best media experience available in a car, say hello to this Headrest/Stand In-Car TFT LCD Monitor (9 Inch). Large enough for anyone, keep those back seat drivers quiet and satisfied with media from this 9 Inch Headrest/Stand In-Car TFT LCD Monitor. The 1024x600 resolution will display your movies brilliantly and widescreen (16:9) display will make it seem like you're right at the movies. Connect a GPS Navigator: Turn left at this corner or turn left at the next one 10 meters up ahead? Does that say Chinavasion Road or Chinavision Road? These are questions that you won't have to ask with this 9 Inch Headrest/Stand In-Car TFT LCD Monitor, which will display every street name and every road in extreme clarity on the 9 inch high resolution screen. 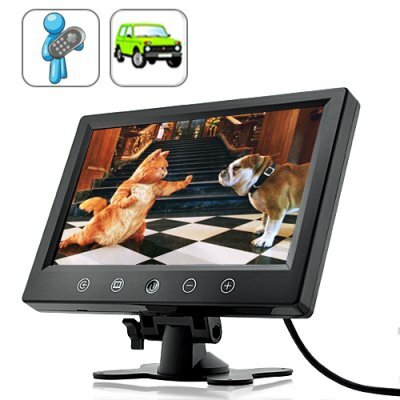 Connect a Rear View Camera: Backing up your car just became a lot easier with this 9 Inch Headrest/Stand In-Car TFT LCD Monitor. Just connect it with a rearview camera and you'll see everything with max clarity on the huge 9 inch display. This multi-purpose 9 Inch Headrest/Stand In-Car TFT LCD Monitor is available in our warehouse right now for at an amazingly low wholesale price and with the added confidence of our 12 month warranty. Brought to you by Chinavasion, the leader in wholesale electronics and car accessories. Red is positive, black is negative! How come the car rearview camera does not automatically turn on when I go in reverse? Be sure to connect the green wire. You can also switch modes manually using the remote or pressing the button on the front.